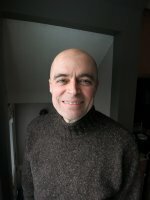 Congratulations to Fred Comeau for successfully completing his Ph.D. Candidacy exam. Fred is an interdisciplinary Ph.D. student with CS as his home department, and his thesis research is in the area of Knowledge Representation, on Concepts and Prediction Machines. He came to our lab after the retirement of his original advisor, David Scuse. 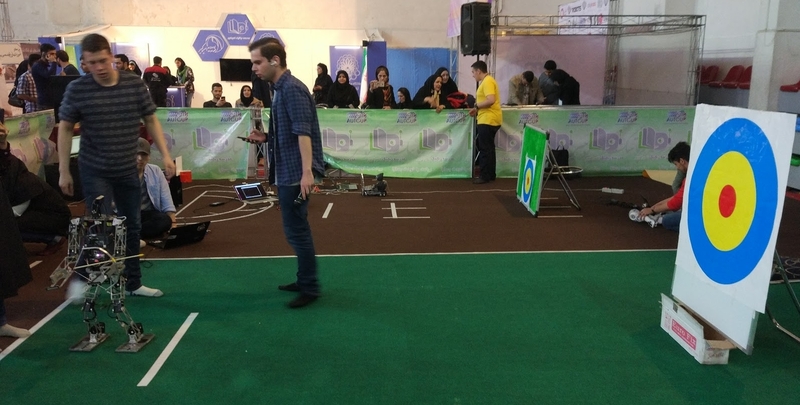 We just got back from our first appearance at the Amirkabir University International Robotics Competition (AUTCup) in Tehran, Iran. 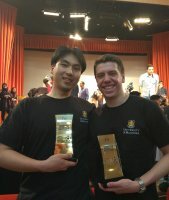 We took first overall in both divisions (kid and teen size) of the Hurocup league. 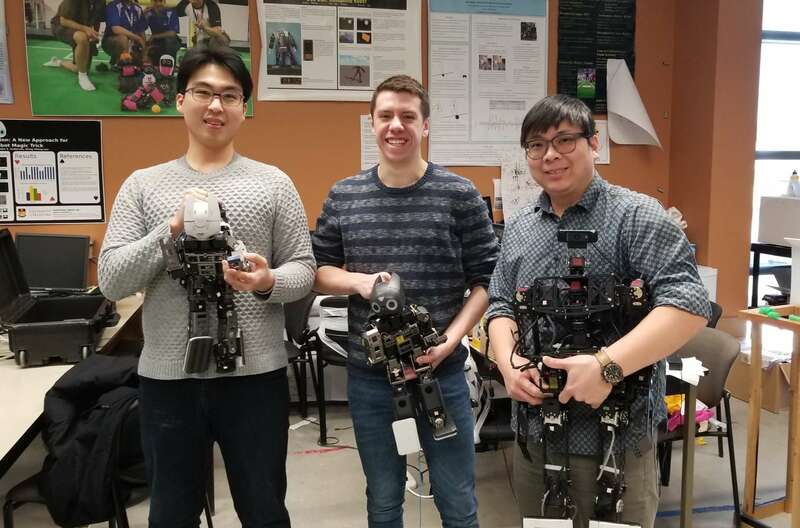 Pictured above-left is our Post-Doctoral Fellow Meng Cheng Lau (Center) with the two Computer Science Undergraduate Students who went to the competition, Mario Mendez Diaz (Left) and Jin (Dylan) Park (Right). 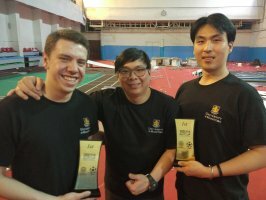 There were more than a hundred participants across all the leagues in the competition, from eight countries: Iran, Canada, Taiwan, Malaysia, Korea, Mexico, Brazil, and Germany. 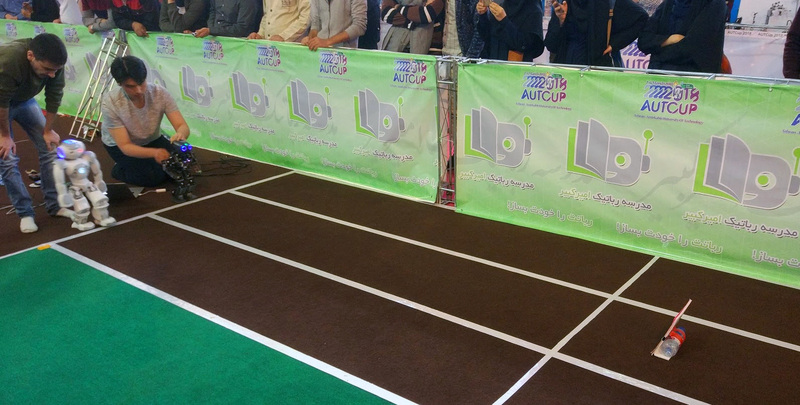 The many leagues included everything from wheeled robots to drones, but our entries involved the FIRA HuroCup - this is a multi-sport event for humanoid robot athletes, in which the same robot must be used in all events. 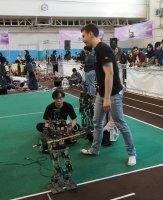 To win the overall competition a team must perform well across a range of events, each of which challenge different aspects of control, perception, and planning. We will be participating in the main FIRA HuroCup event in Taiwan later this summer, so this was a useful test of our work so far at a local level. While even with significant support from Amirkabir we could only send three representatives, these entries represent a major period of work in our laboratory by many people. In addition to Professor John Anderson and the members of the lab who went to the competition, this includes Amir Hosseinmemar, Ph.D. student, Chi Fung (Andy) Lun, 4th year CS Undergraduate, Kurt Palo, 2nd year CS Undergraduate, and Ziang Wang, ECE M.Sc. Student. Congratulations everyone on this great result. Now we move to work on RoboCup, in Montreal, and the main FIRA HuroCup, in Taiwan, both later this summer. 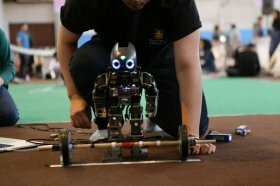 Tomorrow, Our post-doctoral fellow Meng Cheng Lau and two Computer Science Undergraduate students, Jin Park and Mario Mendez Diaz, are heading with our robots to Amirkabir University in Tehran for the humanoid robot competitions at the 2018 AUTCup. We have been collaborating Amirkabir University since 2013, and this will be the first time we have put a full team into their competition. Look for results here in the coming days! We will be also partnering with Amirkabir as well as National Taiwan Normal University for a humanoid team at RoboCup 2018 in Montreal in June.